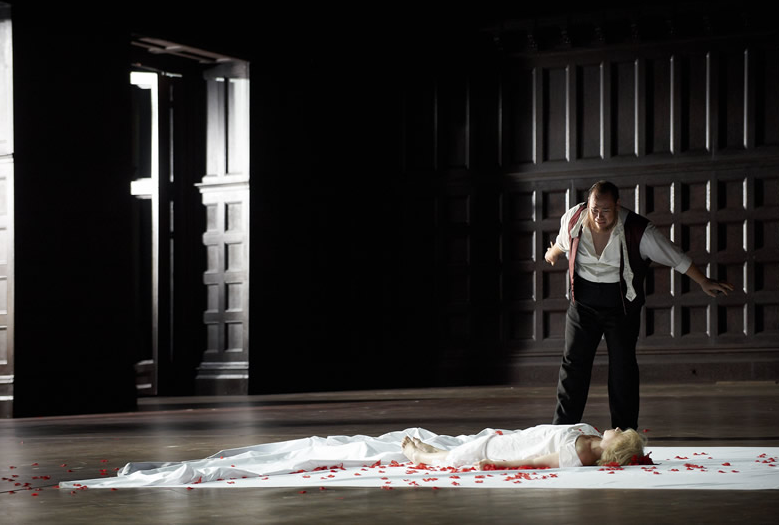 The reviews I'd read of this production were almost unanimous in their praise of the singing and acting, but mixed in their opinions of the production itself, a co-production with the English National Opera, based on a Lyric Opera of Chicago production of 2000. 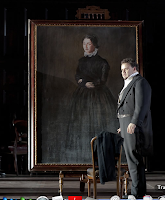 Director of this production is Christopher Alden, who had previously caused a stir with his Canadian Opera Co. production of The Flying Dutchman, as well as New York City Opera's Don Giovanni. The action has been updated from Renaissance times to the time of Verdi, with a unit set that resembles a Victorian gentlemen's club. The concept has to do with this haven of male dominance, where the only women are servants or victims. 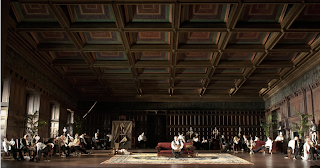 All the scenes take place on this set, in various dark corners or with furniture or lighting rearranged, while Rigoletto himself spends a lot of time in a leather armchair in front of the curtain line, curtain up or down. The chorus and nearly all the characters were present for most scenes, occupying the sidelines when they were not part of the action. The suggestion was that all the scenes were memories tormenting Rigoletto, not experienced in real time. 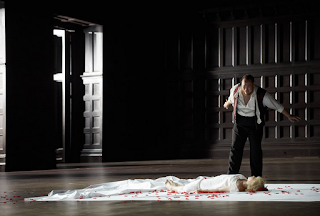 I've written before about my opinion of updated or concept opera productions. 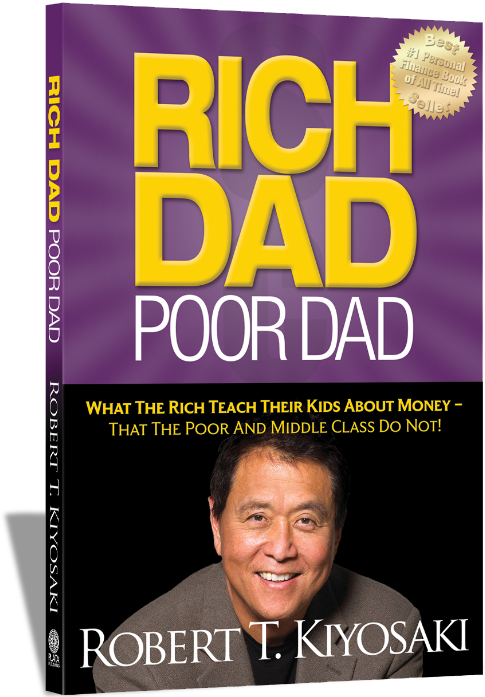 The purpose is usually to clarify character relationships and societal power structures. More often than not I find the production does not succeed, and it muddies or distracts from the depiction of those very relationships. I want to make it perfectly clear I loved the singing and acting. I had never heard Quinn Kelsey before, but I know I'll hear him again. His singing, although briefly woolly at the very beginning, had a beautiful, free and passionate sound for the remainder of the opera. 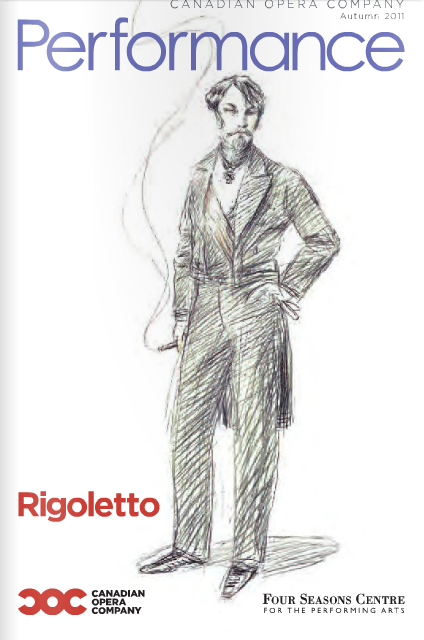 His acting also was passionate, and we knew Rigoletto's pain as an outsider and an anguished father, and his tenderness toward his beloved Gilda. I'm a great admirer of David Lomelí's singing, and I think the Duke fits his voice like a glove. Considering some of the director's choices in staging his scenes (Two of his three arias from a sofa? Really?) he deserves extra points for singing so consistently well throughout. In fact, all the singers do. Conductor was Johannes Debus. Although he and the COC Orchestra in many ways were quite good, it seemed at times there was a disconnect between the pit and the stage, and some of the tempi seemed a bit frantic. There were a few moments when the orchestra overpowered the singers. The men of the COC Chorus, under the leadership of Sandra Horst, are to be praised for their singing and their committed involvement to more stage business than one often sees in a Rigoletto chorus. 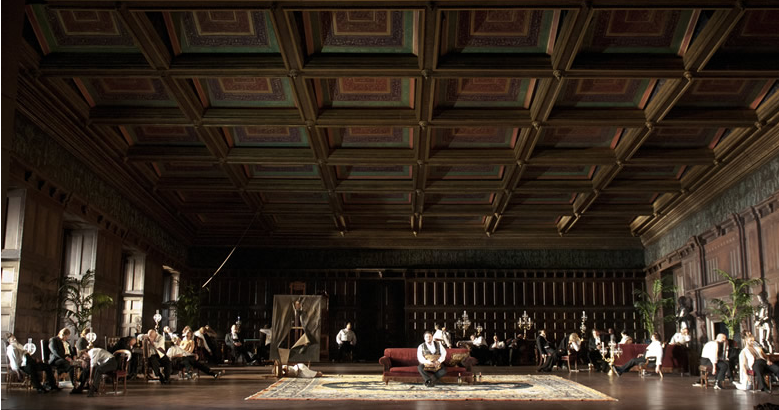 I loved the set and costume design of Michael Levine, and the lighting design of Duane Schuler. Visually everything was stunning. I hardly noticed the forced perspective and steeply--painfully, even--raked stage I was later told about, which suggests they were successful visually. I do take exception to a Sparafucile who looks like Riff Raff from The Rocky Horror Picture Show. Then again, Riff Raff's appearance was a reference to period illustrations of Dickensian nether-world characters, so what do I know? Regardless of costume, Phillip Ens sang Sparafucile with beautiful sound and ringing low notes. This is the point where I could be like other opera bloggers and gleefully list every single point where I disagree with the director's execution. Does Maddalena (well sung by Kendall Gladen) really have to dance like Carmen? Why is Giovanna in every scene, appearing to grow more and more mad and looking very much like Mrs. Danvers in Rebecca? I could go on, but I won't. That's not really me. Even though I had problems with the concept and execution, I can not say they ruined the opera for me. I've always said I'm about the singing, and the singing I liked very much in every case. Thanks for the review. 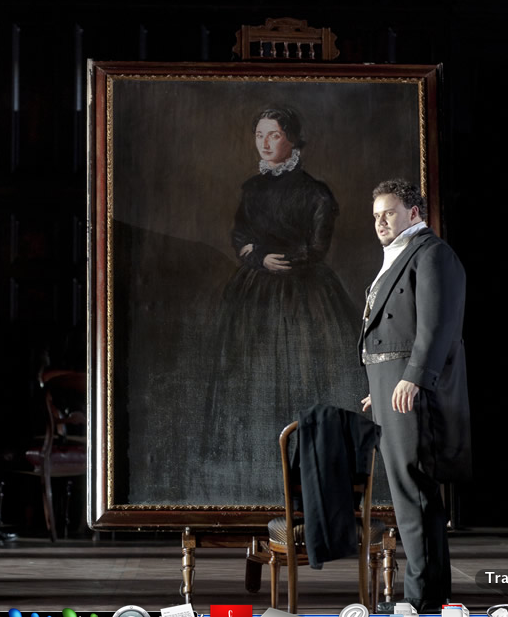 You talk about Giovanna growing to resemble Mrs. Danvers as though it's a bad thing... ;) I'm actually rather jealous of the opportunity to see a Victorian Rigoletto with more than a dash of literary theory in the background. And I'm quite jealous of the chance to hear Mr. Lomeli's Duke! Glad to hear it was a rewarding performance.